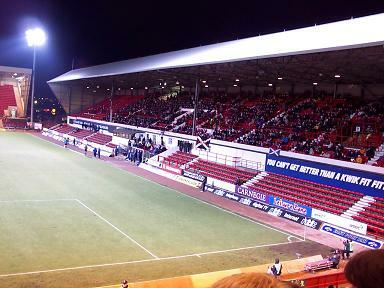 The pitch would replace the existing turf surface next summer and be played on for the first time during season 2004/05. The incredible news has been reported in the press and on Sky Sports news, with Dunfermline being the only team from the British Isles included. Russia, Switzerland and a Scandinavian nation are the other countries to benefit from the �130,000 cash boost for the scheme. The revolutionary idea will see all four clubs being used as test cases by UEFA, who are looking towards further synthetic pitches in the future to reduce the number of call offs in the more "chilly" countries. There has not been any official word from the club regarding this matter as yet, though that will no doubt follow with the release of this news. The East End Park pitch has already undergone major, and costly, refurbishment in recent years. Firstly, the drainage was extensively overhauled to prevent a repeat of the marsh like conditions that were often seen during the 1980s during the winter. A protective "balloon" was then installed to cover the pitch whilst blowing hot air, insert your own gag here, over the park. This costly, and even sometimes unreliable, process was then joined eventually by undersoil heating in the summer of 2002. The pitch at East End is certainly nowhere near the worst in the SPL, with Tannadice and Fir Park being a bit of a joke in comparison. It remains to be seen how successful this new synthetic pitch will be. However, it shows yet again that the club are always aiming to be ahead of the pack with regards to off field activities. The pitch could well be used for training on a day to day basis, without the need to use the bog like Pitreavie during the winter months, which can only help the players. More news will be posted on the subject once we have it.